Teen Mom OG dad Ryan Edwards is currently back in jail after violating his probation by skipping out on his bar tab back in December. The incident seems to be a clear indicator that the 31-year-old reality star is still struggling to get his life together, even after a three-month rehab stint and the birth of his son Jagger in October. I’ve been writing about Teen Mom for a long time, and Ryan’s continued troubles sadden me to an unexpected degree — perhaps because I cannot help but feel the pain of his parents, Jen and Larry, who have been so honest sharing their experience of having an only child with addiction issues. All of the sadness surrounding Ryan’s continuing issues only made it that much more of a joyful surprise when I was checking my Instagram feed earlier today and saw that Mackenzie Edwards had posted a family photo of herself with Maci McKinney, Bentley, and all of Bentley’s siblings! Christan indicates that the photo was taken a while ago in her caption, but she doesn’t share any additional details. “Just getting around to sharing this one,” Christan wrote. It is very possible that it was taken while Ryan was still in rehab after Jagger was born. I realize this is just a photo, and dysfunctional families pose for photos together all the time. But, the animosity between Mackenzie and Maci was to such a high degree, that just being willing to pose together like this, especially with all five children participating, is a shockingly pleasant surprise! 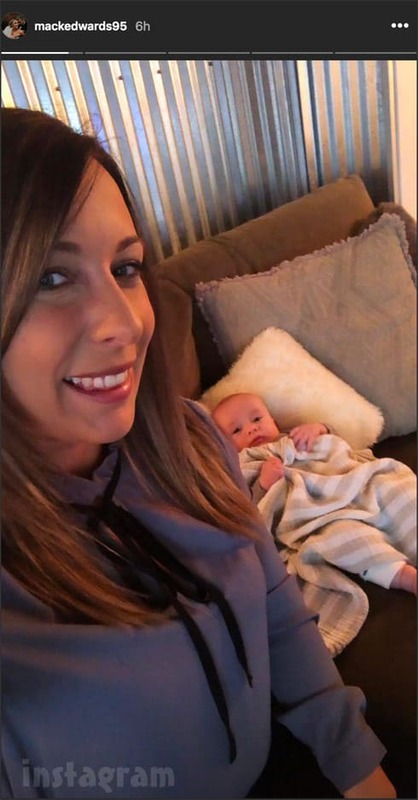 Maci and Mackenzie fighting wasn’t benefiting anyone, and hopefully this photo is evidence that both mothers are putting aside their differences for the benefit of Bentley. I say both mothers, but I really do believe any sort of reconciliation was mostly in Mackenzie’s court. Based on what viewers saw on Teen Mom OG, combined with what fans saw on Mackenzie’s social media, she was blaming Maci for a lot of Ryan’s issues — or at least she was blaming Maci for trying to exploit Ryan’s issues, and also for keeping them hidden from Mackenzie. (I think we all remember Mackenzie’s infamous open letter to Maci that she read at the Reunion with Dr. Drew.) I assume that Mackenzie has since come to realize that Maci was not to blame for Ryan’s actions, or the fact that Ryan agreed to continue appearing on the show. In fact, it was Maci who reportedly drew a line in the sand with MTV and refused to continue filming as long as Ryan continued to film while still struggling with his addiction issues because she didn’t want Bentley to have to see that play out on screen. Of course, it’s not necessarily healthy for anyone (like myself) to try to assign any sort of blame here, but I hope that fans of Mackenzie (or even Mackenzie herself, if she’s reading this) will understand that my pointing the finger at her for being mostly responsible for the animosity between her and Maci is also me saying that she deserves most of the credit for having the maturity to set that anger aside to pose for the photo. Once again, it is just a photo. But I am extremely optimistic that it is an indication that Maci and Mackenzie are now on the same page as far as putting Bentley’s well being ahead of any sort of beef they might have with each other. I was thankful that Maci took her stand with MTV over filming ryan, because I didn’t want to see him on the show any more either if he was continuing to struggle. That being said, I would very much love to see some sort of genuine reconciliation and healing between Maci and Mackenzie on screen next season. And, to be honest, that story can be told without having Ryan on screen at all. UPDATE – Maci also shared the family photo on Instagram, as well as another photo of just the Bentley Bunch! 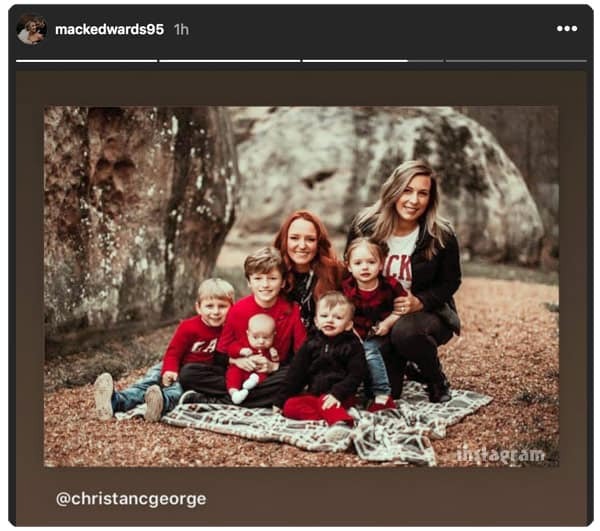 Also, one of our readers pointed out that Mackenzie, Bentley, and her sons are all wearing the same outfits they were wearing in the photo shoot from mid-December that included Ryan, so clearly the Maci and Mackenzie shoot was after his release. It’s unclear if there were any pictures with everyone included. PHOTOS Farrah Abraham’s FroCo frozen yogurt restaurant still a go, opening soon! Are Teen Mom’s Catelynn and Tyler living together? What are their career plans?